Who hasn't had the dream? A walk down the red carpet... an expectant crowd... the presentation of the award... the acceptance speech. "The Academy Award for Best..." "and the Emmy goes to..." "Here she is: Miss America..." "The Pulitzer Prize..." "The Nobel Prize for Literature..."
"I learned the truth a seventeen..." and, while I do not feel that my life has been without accomplishment, I never thought of it as award-winning. I was overwhelmed to the point of stammering when just before Christmas I was asked if I would permit Earth's Angels to honor me as one of four "Distinguished Hope Honorees--Titus Women. These are women whose lives have touched women by teaching and modeling the Word of God, and they are God's precious gems. The community in which we live is a better place because of their tireless efforts to build up, beautify, support, and encourage others. Their work is unto the Lord, but it has not gone unrecognized on earth." K Cummings Pipes was born in Floyd County Texas in January 1949. She, her brother, and her sister grew up working on the family farm. The large extended family attended South Plains Baptist Church where K came to faith in Jesus and was baptized in 1958 shortly after her ninth birthday. The after school meetings of the Girls Auxiliary of the Women’s Missionary Union were one of many places where the church’s older women taught the young women, setting a wonderful example of Christian service. Following a series of community tragedies, K, at the age of 14 years, had sole responsibility for a Vacation Bible School class. Her service as a Bible teacher continued, almost without interruption, for more than forty years. K moved to Houston in 1967 to attend Rice University, majoring in English Literature. As a country girl in the big city, she enjoyed the opportunity and diversity of Houston and attended many churches of different denominations, seeking to appreciate the beauty and wisdom of all the people of God. Sunday evenings usually found her at Central Church of Christ sitting beside David Pipes. They taught and worked side-by-side in Central’s mission to the underprivileged children of Houston’s Third Ward for four years and came to know each other well. After their graduations in 1971, David and K married. Their marriage was not blessed with children but all children became theirs as they taught and ministered to a generation, following them from kindergarten through college. David was ordained an elder of the congregation in 2000 and shepherds the flock with K at his side. K enjoyed a professional career as a medical reference librarian, retiring in 1985. Until health concerns and the demands of caring for her aged parents limited her availability, she spent 20-30 hours a week using her gifts of Bible teaching, tutoring, librarianship, writing and editing at Southwest Central Church of Christ. She continues to pursue her interests in the wisdom literature of Hebrew scripture and the Psalms as a tool to constant prayer. She also collects and studies the work and life of a late Victorian Christian writer at www.evelynwhitakerlibrary.org. And my 5 minute acceptance speech is supposed to be a "teaching" for the attendees. It's really all about them. It has made me aware of the debt I owe to all the women who taught and mentored me. It would take more than 5 minutes or the words that may be put into a blog post to name them and thank them. One of the duties of an honoree is to help spread the good news about the conference so that young women (aged 11 to to 30 years) can be taught and mentored. My dearly beloved is sponsoring those women of our church who wish to attend and our minister Steve Sargent is recruiting. Earth Angel's Conference 2012 information and registration. "The Lord is my light and my salvation whom shall I fear. The Lord is the strength of my life, of what shall I be afraid... I hope to see the goodness of the Lord in the land of the living. Wait on the Lord. Be of good courage and God will strengthen your soul. Wait, I say, on the Lord." SEASONS met this morning to finish our discussion of Dorothy Day: Selected Writings. By Little and By Little. Edited and with an introduction by Robert Ellsberg. Maryknoll, NY: Orbis Books, 1992. My copy of this book is heavily highlighted and I've read it multiple times. When we selected this book for SEASONS we were looking for a lodestone to help us endure this election year. I skimmed my highlights this week and found 18 sections that I tabbed for discussion. It is a book that has been important to my spiritual formation. Among many other things Dorothy Day taught me to care deeply for the poor. 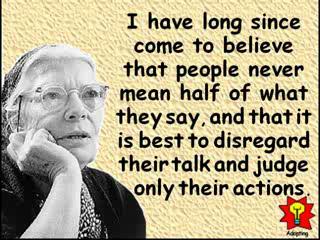 Dorothy Day “wrote to give reason for a marriage of convictions that was a scandal and a stumbling block to many: radical politics and traditional, conservative theology. Yet it was not what Dorothy Day wrote that was extraordinary, nor even what she believed, but the fact that there was absolutely no distinction between what she believed, what she wrote, and the manner in which she lived.” p. xv Ellsberg’s introduction. We drew our discussion from "Small Things" (p. 74) from Day after Day, excerpts from her personal reflections and her editorials for The Catholic Worker. I suppose it is a grace not to be able to have time to take or derive satisfaction in the work we are doing. In what time I have my impulse is to self-criticism and examination of conscience, and I am constantly humbled at my own imperfections and my halting progress.... I do know how small and I am and how little I can do and I beg You, Lord, to help me, for I cannot help myself." (p. 274) "The significance of our smallest acts! The significance of the little things we leave undone! The protests we do not make, the stands we do not take, we who are living in the world!" (p. 96-97) "In Christ's human life, there were always a few who made up for the neglect of the crowd.... We can do it too, exactly as they did. We are not born too late. We do it by seeing Christ and serving Christ in friends and strangers, in every one we come in contact with.... For a total Christian, the goad of duty is not needed--always prodding one to perform this or that good deed. It is not a duty to help Christ, it is a privilege." The Duty of Delight: the Diaries of Dorothy Day, edited by Robert Ellsberg is available in a Kindle edition. I also recommend a movie Entertaining Angels (1996) which I recently watched on Netflix. SEASONS [Sisters Enjoying A Season Of Nurturing Sisters] is a group of women who meet monthly to read and discuss theology and to support one another. We usually meet at Southwest Central Church of Christ. Our next book is An Altar in the World. A Geography of the Faith. 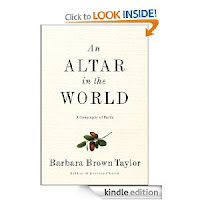 by Barbara Brown Taylor.